This Absolute Natural Color image shows us a specular reflection, or Sunglint, off of an Hydrocarbon Lake - named Kivu Lacus - which is located on the Saturnian moon Titan. Kivu Lacus is a relatively small Lake for Titan - about 48,2 miles (such as approx. 77,57 Km) wide - and it is found very close to the moon's North Pole. The view was obtained during the NASA - Cassini Spacecraft's Fly-By that occurred on July, 24, 2012. This was the most intense specular reflection that Cassini had seen to date. However, the NASA - Cassini Spacecraft saw its first specular reflection on Titan on July 7, 2009 and that image provided us with a solid confirmation of the presence of liquid on the moon's Northern Hemisphere. Specular reflections can only be seen when the NASA - Cassini Spacecraft is in the right place relative to the Sun and Titan, so that the mirror-like reflection from a Lake reflects Sunlight directly to the Spacecraft. In order for this circumstance to occur, it is (of course) required that the Sun is (quite) above the Horizon at the location of the Lake (which is why no specular reflections were visible until after Titan's Northern Spring Equinox, which happened in the AD 2009, when the many Hydrocarbon Seas existing on this fascinating Celestial Body finally became illuminated). 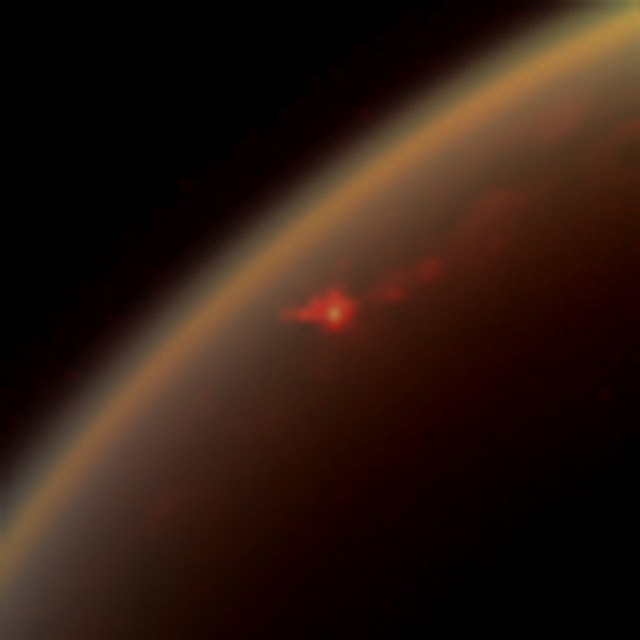 The bright, yellowish area visible on Titan represents the glint off of Kivu Lacus. The reddish reflection is a specular skyglow (---> Haze illuminated from below by the specular reflection of the Sun off of the Lake). The faint orange/pinkish color coming from just above the reflection has been suggested to represent the first (huge, most likely) Waves ever seen on Titan's Lakes and Seas, and thus the first Sea-Surface Waves ever detected outside of our Home Planet Earth. The view was obtained by the NASA - Cassini Spacecraft's Visible and InfraRed Mapping Spectrometer (or "VIMS", for short) instrument at a distance of about 18.600 miles (such as about 29.933,724 Km) from Titan. According to NASA (but we, as IPF, disagree on this point) this is not the same Visible-light color that the human eye would see. At Visible Wavelengths, NASA Scientists said, the human eye would just see a hazy orange orb, and would not be able to catch the specular reflection, which would be scattered by Titan's Atmospheric Haze before reaching the Outer Space. This frame (which is an Original NASA - CASSINI Spacecraft's False Colors and NON Map-Projected image published on the NASA - Planetary Photojournal with the ID n. PIA 18433) has been additionally processed, contrast enhanced, magnified to aid the visibility of the details, Gamma corrected and then re-colorized - according to an educated guess (or, if you wish, an informed speculation) carried out by Dr Paolo C. Fienga - in Absolute Natural Colors (such as the colors that a human eye would actually perceive if someone were onboard the NASA - Cassini Spacecraft and then looked outside, towards the Saturnian moon "Titan"), by using an original technique created - and, in time, dramatically improved - by the Lunar Explorer Italia Team. Different colors, as well as different shades of the same color, mean, among other things, the existence of different Elements (Gases) present in the Atmosphere of Titan, each having a different Albedo (---> Reflectivity) and Chemical Composition.